Sit by the campfire and soak up the earthy atmosphere. With 3D sounds! What could be more relaxing and refreshing than camping in the forest? 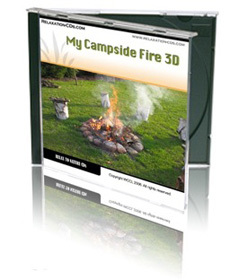 This CD will re-create for you the experience of sitting beside a campfire at night, the sounds of the forest going on all around you. Close your eyes and you’ll imagine yourself in a forest clearing. You’ve just enjoyed a delicious meal cooked on the open fire and now you sit back, sated, listening to the fire crackling. And when at last the fire has burned itself out, you’ll feel relaxed and re-invigorated - ready to return to civilization, but knowing that your campside fire is always available on this CD, any time you wish to return to it!